Good morning everyone, hope you are well :-) Well, here is one of the projects I have been so excited to share with you, its a Wreath for day two of Crafty Ribbons Advent Event. 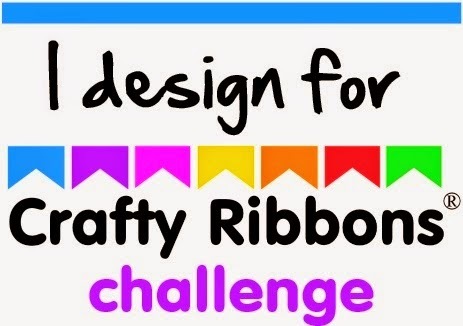 You really should play along with us because there are some fantastic opportunities for prizes and some fantastic inspiration from the Design Team. Today our sponsor is Joanna Sheen who has given two Thomas Kinkade decoupage packs as the prize so well worth a try! For this wreath I used a florists wire wreath which had two wires around the inside and the outside. I added a third wire myself within the two so I could fill out the wreath really well with the ribbons. I tied lots of different ribbons and organza fabric cut into small pieces anywhere I could until it was really full. I used these Jam Pot Collection of ribbons from Crafty Ribbons padded out with some organza fabric. I love the colours and the spotty effect on this wreath. Oh WOW, absolutely amazing! The colour is just gorgeous and so is the quality of the work you put in. Hello Elaine; your wreath is gorgeous in all those bright and beautiful colours! I love it! It's stunning!I absolutely love it. Wow, a stunningly beautiful piece of artwork. Simply stunning Elaine! I do love the bright colours they look amazing. This is just DELICIOUS!!! A real work of art! What a super wreath. Sorry I'm late in visiting, Elaine, I got back in much later than anticipated yesterday. Happy Hopping! wow love it must give this a try. wow! How long did that take! Its brilliant! Thank you for joining us at Emergency Crafters.